As stated before I’m a fan of the roads not taken with science fiction (and have a blog dedicated to it – including an entry on Star Trek: Phase II) and this was one of the first books on the topic I owned. 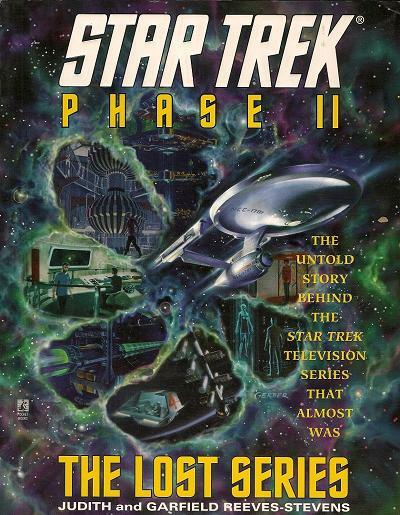 Star Trek: Phase II: The Lost Series is the second of three “making of” Star Trek books by the husband/wife Reeves-Stevens team (the others being for Star Trek: Deep Space Nine and Star Trek: The Next Generation) but the most interesting because it is about a series that was never made. With interviews and access, the Reeves-Stevens have fashion definitive text on the subject. Unfortunately, as such, it is also actually defined the subject. The Phase II name, for example, was in reality a parenthetical usage at best, but used to differentiate between the series (with an actual working title Star Trek II) and other things such as planned movies and the working title of Star Trek: The Wrath of Kahn). That said, it’s really the best book available, probably the best that will ever be available on the subject, so if you’re interested in this lost moment of Star Trek history, I recommend this book.